The 2017 Annual Report is here! WWAMH is pleased to release our 2017 Annual Report in digital format. This report was mailed out last month to all of our supporters on our mailing list. We hope you enjoy the agency updates and touching stories about our clients. You won’t want to miss this! PreviousPrevious post:5.8 Million Awarded to Build Affordable Housing in Glens Falls: Warren-Washington Association for Mental Health to Break Ground in the SummerNextNext post:WWAMH is going Tobacco Free! WWAMH is going Tobacco Free! 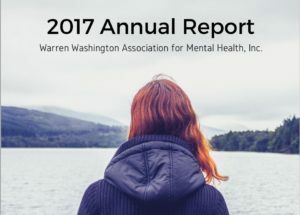 The Mission of the Warren-Washington Association for Mental Health, Inc. is to improve the quality of life for those affected by mental illness and to promote the awareness and importance of mental wellbeing in the community. Warren-Washington Association for Mental Health shared a post. Warren-Washington Association for Mental Health, Inc.